By Tony Grant, Field Editor. Have you been catching fewer muskies over the past few years? Many anglers have. Twenty-plus years of guiding and tournament fishing have taught me that things change in musky fishing, decade to decade, month to month and day to day. Anglers who understand these changes and adapt accordingly generally enjoy the most success. Getting stuck in a rut can be one of the worst things that can happen to a musky fisherman. Yearly, I look back at both the highlights and low points of the past season and reevaluate my goals, techniques and strategies for the coming season. Here are some of the changes that I made over the previous few seasons that helped me put more fish in the boat. Author Tony Grant on the water. Casting has been my preferred method for muskies since I started in the 1980s. I have always used trolling as a secondary method for my clients, but I have since realized to be successful, musky anglers need to balance the two. A promise I made to myself in the off-season a few years back was to look at trolling just like any other presentation, and it’s been a great move. Whether the reason is bluebird days, discovering new water, giving our backs a rest, or unusual amounts of baitfish in open water, trolling should be added as just another technique to get the most out of the time you have on the water. The amount of water you’ll cover with your bait is tremendous. Remember you don’t have to be in deep water to troll, as shoreline trolling can be done in as little as four feet of water with just a few feet of line from your rod tip to your lure. Propwash muskies are common. Add linecounter reels to your equipment so you can run the same amount of line after a bite. The Cold Water model by Okuma is dependable and will get the job done. All musky anglers know the tremendous success that big blades have produced since the Double Cowgirl was introduced by Musky Mayhem Tackle nearly a decade ago. They have accounted for hundreds of muskies in my boat, but there are times that they are not my highest percentage lure. I vowed to alter my choice of blades from time to time. Downsizing to smaller blades many times saved our day and my spinnerbait production has jumped to equal years past. These alterations in my blade bait selection has been crucial to my clients success when the muskies were holding super-tight to weeds, in post-frontal conditions, and on hot, sunny days. Slow-rolling single-hook spinnerbaits through weeds can be very productive when muskies are holding tight in shallow cover. My favorites have been Grim Reapers, Llungens and Rabid Squirrels, all of which have single hooks that easily come through weeds. Very few anglers have done much vertical jigging for muskies. In fact, you could count me among them until the 2012 season. However, beginning in 2013 my mindset was to add this technique to my arsenal and it paid off with some big fish. In 2014, my clients and I extended the amount of time we spent vertical jigging and it produced some of my best days of the year. Standing timber and deep weed edges are the places for giants. I have found the best results with Red October tubes, Bondy Baits, Musky Innovations’ Rippin’ Dawg and Meyer’s Vertical Dancers. Remember, the depth you jig can make all the difference — try a 4-foot vertical rip at different water column depths. Another important factor to jigging is your leader, I’m convinced a 36-inch Stealth trolling leader gets more strikes, and linecounter reels (like those for trolling) help keep track of the depth. 2.) Returning to a community spot several times with quick passes can pay off — just keep an eye on the spot and pick your times. This off-season, think about how many fish are taken annually off those hotspots, and use that to your advantage next season. Analyzing who you fish with, whether guiding, competing or just fishing, is an overlooked aspect. This became a focal point for me during last years sports show season and I put the plan in motion to start 2014. Recognizing my partners’ strengths and weaknesses proved to be a crucial factor. Cast lengths, figure-8’s, retrieve speed and alertness should decide what baits are being cast from which position in the boat, and where you should hold your boat on structure or over cover. 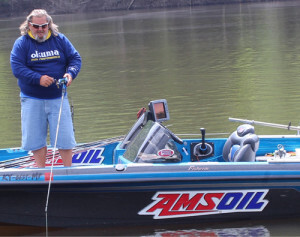 Whether you’re fishing with a seasoned veteran or a first-timer, understanding how to get the most out of them will improve your odds at putting fish in the boat in almost all conditions. The anglers who file their past experiences in a memory bank make the best musky fishermen because experience trumps everything. As we grow as anglers, we tend to distance ourselves from our past success whether it be lures, technique or presentation. This valuable memory bank is crucial to your future production. A great example of getting back to the past is my clients’ success with the spinnerbaits mentioned earlier as well as the Sledge bait, a longtime producer on my home water of Cave Run Lake. After a slow season with them a few years back I had cut back how much we were using them, but in 2014 I decided to give them as much water time as in the past, with great results. Changing your tactics from year to year is crucial for the musky angler. Changing weather patterns, weed growth, angler pressure and fluctuating water levels are just a few conditions that demand change. Plan to do more trolling, put the best lure type in your boat partners’ hands, and explore jigging to raise your percentages. This winter, take some time to analyze your game plan. If you try some new things while at the same time relying on what was successful in the past, it could be your best year yet. ← Early Season Debate: Cast Or Troll?